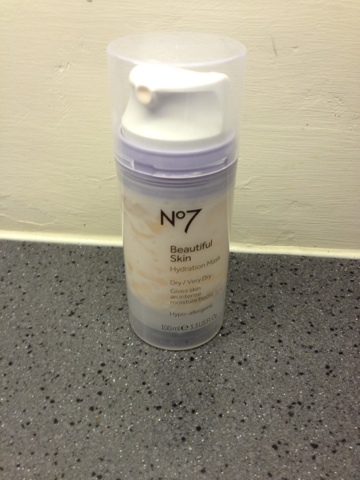 I bought Boots No 7 Hydration Mask recently as part of the No 7 3 for 2 Special offer at Boots, this is for Dry to Very Dry skin, it says to use this mask for 3 minutes and then to wipe off or for an intense treat apply for 10 minutes before wiping off, however I am using this as more of a night cream or just a base before I put my normal moisturiser on and not wiping off just because my skin really needs the moisture at the minute - it's so lovely and moisturising! My skin has gone really dry and flaky recently, I think because of going from warm-ish weather to absolutely freezing, it's playing havoc with my skin! So this really has been good for my skin, it's also hypo-allergenic so is good for sensitive skins! The only slight issue I have with this product is that when you pull the lid off, the pump attachment sometimes comes with it so if you do it with any force (which you have to sometimes to get the lid off) you can end up with product all over you, this has happened to me twice, once when trying the sample in Boots (quite embarassing!) and also with the one I purchased, so be careful with that if you get it! Other than that, I really love this and it's definitely become a bit of a staple in my cleansing routine. Have you tried any of the Beautiful Skin range? 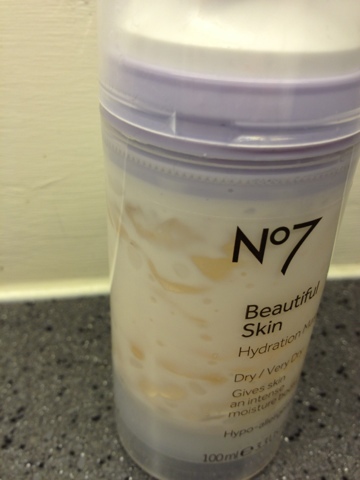 2 comments on "Boots No 7 Hydration Mask"